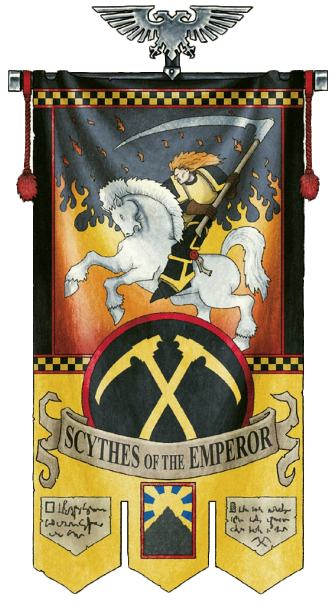 In more recent times a lot of official background on the Scythes of the Emperor has been published. It has been a great period to learn more canonical history of our favourite Chapter. The new Primaris Codex (2017) has confirmed cross over keyword traits from the Ultramarines. So after that fairly compelling evidence, the following uses of Ultramarine Heraldry artwork for core markings of the Scythes have been used ahead. Earlier Codexes, suggestion: instead of Codex shoulder trim colours for Company marking, one used the knee pads (A marking style used by Ultramarines). **This is a personal choice, as I feel it keep the classic Scythes look unmolested by clashing colours on the Aquila in 7th and the new Primaris Codex. An interesting variation; Black Skull on Shoulder, Power fist decoration and right leg showing Unit Marking or Company Marking. UPDATE: 7th Ed. codex and the new Primaris Space Marine Codex both use a marking system as seen in Ultramarine 6th & 7th Co.
UPDATE: Fellow Sothan, Alex. R has informed us we can find 4 Black skulls, exactly the right size to be found on the Skitarii and Cult Mechanicus Transfer Sheets. Hit up eBay or your Mechanicus friends! The only historic art reference for Scout Squads is in Advanced Space Crusade & Tyranid Attack. Squads use Company Colours across their Aquila also, in a checker pattern. The Scout examples showcase the classic ‘Tyranid Attack & Advanced Space Crusade‘ boardgame version (including a version I use personally, centre). The third is an example of the modern Scout painted with a mind to the original scheme shown in the first iterations of Scythes artwork. (Black fatigues, yellow sections). Scouts are always in the Tenth (X) Company. So it is irrelevant to show this. However the right shoulder on contemporary scouts displays the Squad number. Ever since Advanced Space Crusade and Tyranid Attack, Scouts have been shown to use a single Scythe icon as Chpater marking. In Advanced Space Crusade (1990) this was noted, and I quote, “The Double Scythe was a sign of veterans”. My personal take, and a decision of your own: Scouts earn the Dual Scythes when they become a Power Armor enabled Brother. 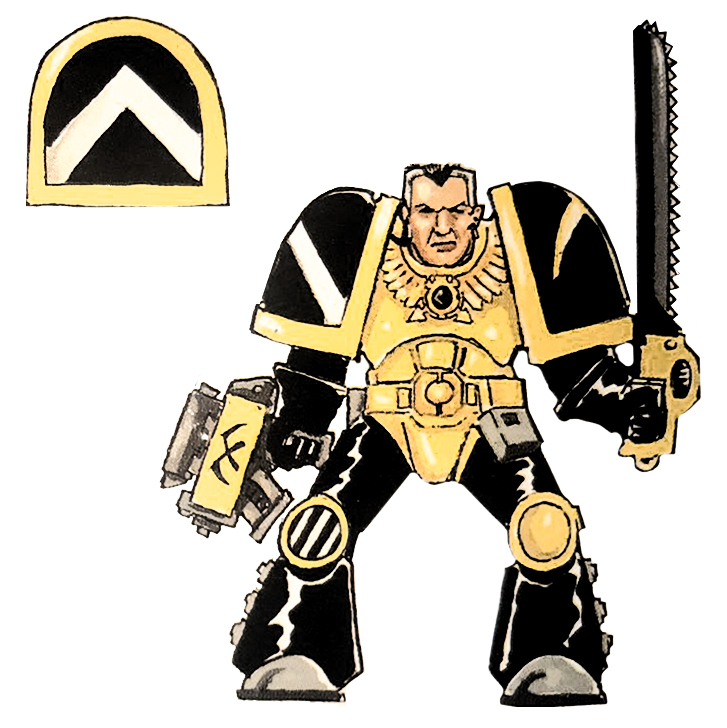 The Scythes of the Emperor marine above, also has a Damnos Campaign badge on his left greave. The following are examples of Campaign badges you can use or create similar to mark your Scythes’ battle honours. A Scout of the 1st Squad. Note the traditional topknot and scythe shaped ear-ring. 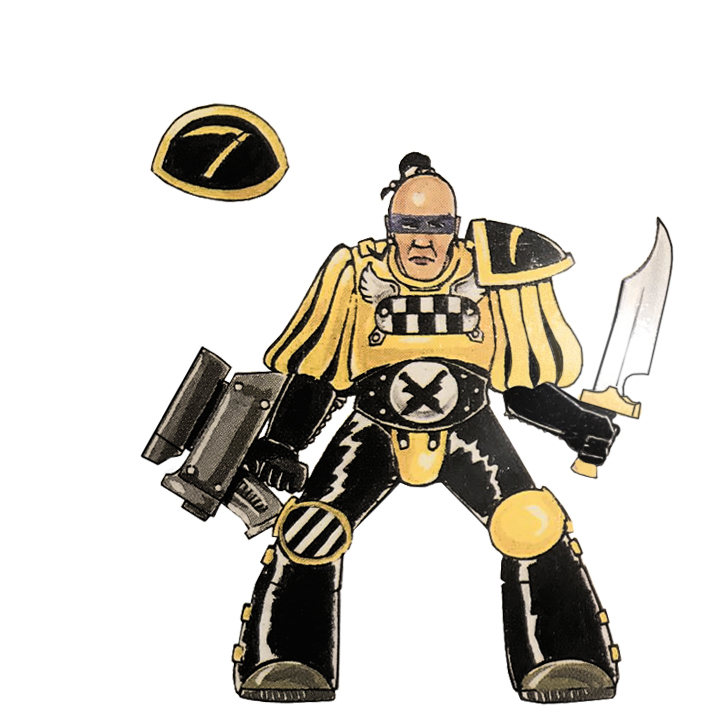 The right knee pad bears the black and white striped badge of the Kraken Campaign – all troops (not just Marines), vehicles (and even weapons) used by the Imperium in the war against the Hive Fleet Kraken have been issued with this badge. Key Elements: The Horseman with Scythe, Yellow/Black Checker and further Horse head and Checker elements on the boltgun. Key thing is, they adopt a very Greek style to the art. Below is the latest Chapter Banner artwork, from within the pages of ‘Slaughter at Giant’s Coffin’, by LJ Goulding. Displaying standard Imperial iconography, Red Trims, Yellow Checker, Horseman astride Abrax (Father of all horses), even an icon eluding to the Light of Mt Pharos. The 2nd Company Banner, lost on Miral, shows Horsehead embellishments on the cross bar, a classic Kalidescope effect pattern with Conabos Rampant, Black and White Checker plus Crossed Scythes on the gauntlets. 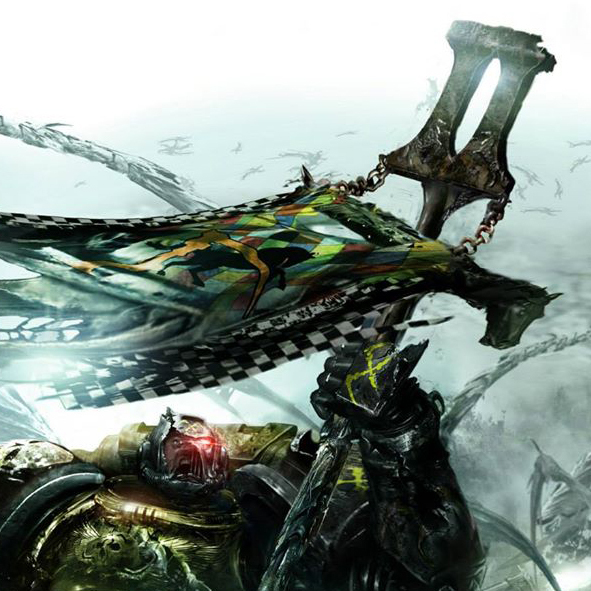 1990’s Tyranid Attack shows a Scythes Officer, more recently (2015+), attributed in modern books as the Founding Master of the Scythes of the Emperor Chapter, Oberdeii. It could be suggested to show the writ of succession that Chaplain Segas provided Oberdeii to sign, brining into being the Scythes of the Emperor Chapter. Again you see the strong Horseman symbology, Checker and more classic Ultramar embellishments. This Heraldry archive will be continually added too as more art becomes available. So this got me all motivated to get started on my scythe primaris marines. Finished (mostly) a primaris captain on that painting challenge and tagged you via twitter. Not sure if there is a better way to get you pictures. I’ve just started painting my new Primaris marines as Scythes, just wondering if Sergeants, Lieutenant and Ancients helmets would follow the ultramarine examples in the Primaris book? I get could paint them however but I’d prefer another couple of opinions. Hi Trent, the Primaris present a host of new options – I really should obtain the new codex for them. I believe they will follow the Ultramarines again, given that they operate the eastern line of Ultramar and fight under Decimus Felix, an Ultramarine Primaris Tetrarch governing from Vestpastor. It wouldn’t make much military sense to stray from the Ultramarine way and Codex given the new integrated Chapter “Legions” Primarch Guilliman is using. Thanks for the reply, I thought that they would follow the Ultramarines, it’s good to get another opinion. Cheers. Just picked up the Deathguard Deathshroud scythes from forgeworld for my captains. Once some squads are ready for the table top I send some photo of ’em your way. 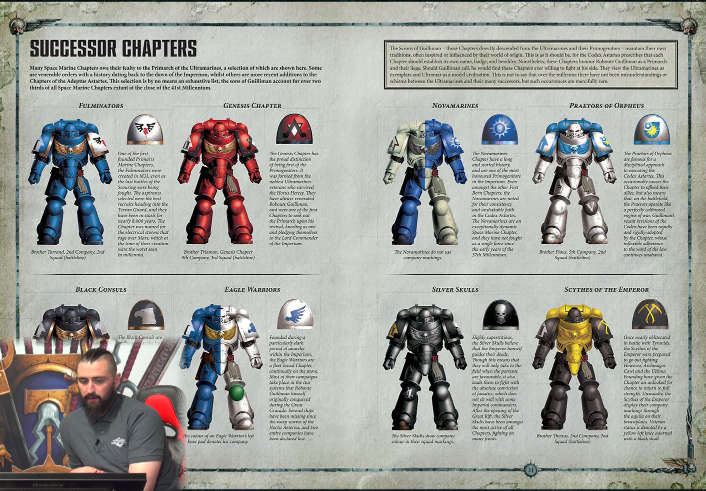 Theyre a successor to the Ultramarines, so very likely to follow codex organisation, couple quirks being Company colour placement and veterans having a yellow knee with black skull icon. Top stuff, those FW Scythes weapons are great, they will be in an article for modelling Scythes marines with all their peculiar weapons and themes I am putting together. Look forward to the new Primaris Scythes, thank you! Awesome update mate, that is amazingly useful. Thanks heaps. Just a quick final question any ideas if any of the current transfer sheets have a black skulls that i could use for knees on my veterans? i had a quick look around and could only find some on the imperial knight kit. @ Trent: There are 4 small black skulls on the decal sheet that comes with the Skitarii and Cult Mechanicus kits. Perfect size for Space Marine knees! Oh brilliant tip, thank you Alex! Chapter Master question. In the masacre at giants coffin was the iron helm of the warden of sotha lost? 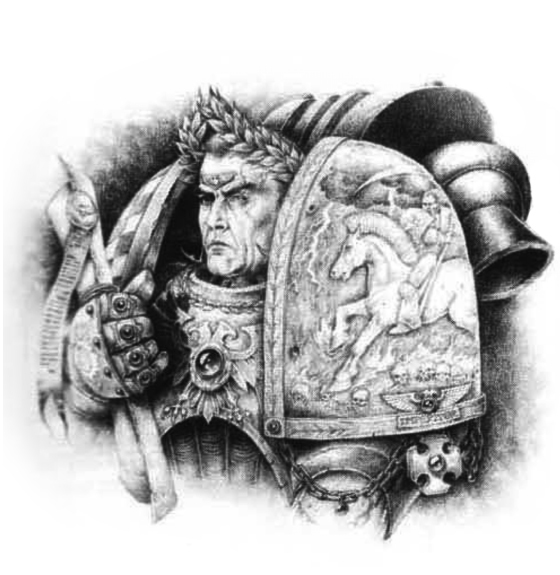 If so what would chapter master Thracia don? Would he go helmless as penace for losing sotha or would he have another helm made to look like it? This is a point of contention for me too after Slaughter at Giants Coffin. The Iron Helm was a Chapter Relic and whilst I get the idea that leaving it behind was accepting the fate that Sotha is gone and so too the need for a Warden, I do feel it’s loss is acute with regard to Chapter Flavour. I was gutted in the novel when it was burnt, as soon as I read that I thought about making a chapter master w/ an iron warriors skull helm. I potentially will make Thracia anyway just with an iron painted helm. Its a nice piece of lore to add in. The heresy typhus model will be my starting point for this. 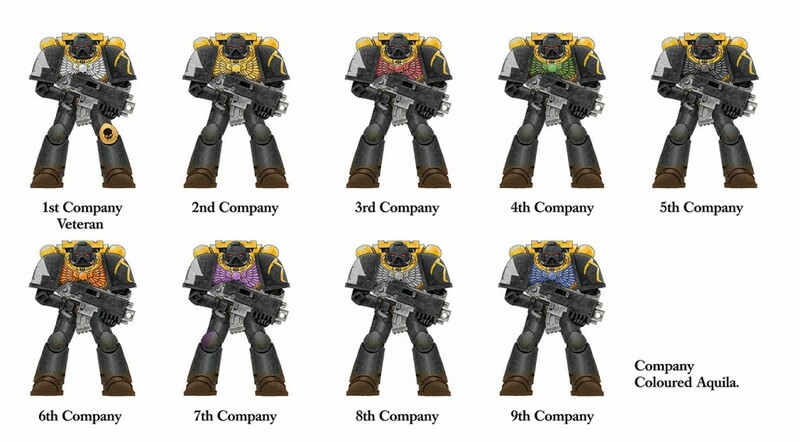 Is the aquila on the 2ed company of the Scythes of the Emperor gold like the Ultramarines or yellow like there armor? 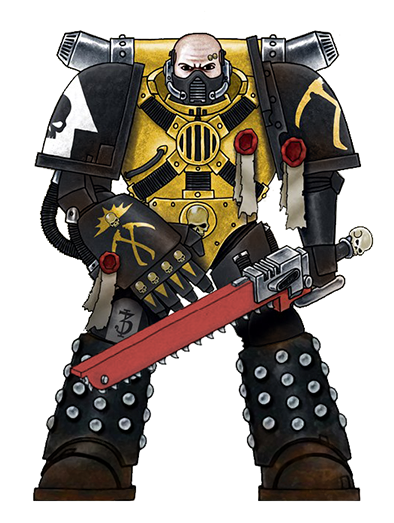 Also does anyone know why some Scythes of the Emperor army’s/Chaplains have red guns instead of black guns? Is it a contrast thing or does it have some kind of meaning behind it. I can’t find anything online about it. Thanks for making this website it is really useful. No trouble David, I’ve had the site going since 1997, so anything that’s popped up about the Scythes – I’ve made a point to host it here :) Thanks for visiting! Thanks for the information. Also I usually don’t see the power pack on the Scythes of the Emperor. Does there power pack use the same silver bits/pattern on the vents and exhaust as the Ultramarines power pack? I am also not sure what color I should paint the cloaks on the Primaris Captains? What color do the Scythes of the Emperor use for cloaks? Thanks for the help. Hi David :) You’re welcome. I’ve generally kept to painting silver parts like vent rims and and exhaust vents with metal. The actual armor components being the yellow plate colour. You are right though that there has never been rearward facing art. I would err on the Ultramarine side of uniform accessories, as they are closely related and especially more so now that Roboute has declared them wardens of the eastern borders as part of a Greater Ultramar. So on that note, going onto the Cloaks, I would follow the Ultramarines – which I believe is red, a colour the Sothans have used in their own heraldry a few times already. 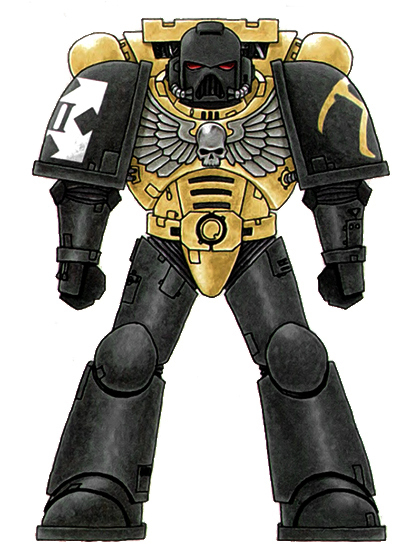 Whilst black might seem the best choice, artisitcally it would really make for a less dynamic finish as opposed to Imperial Red bouncing off the Black and Yellow of Scythes armor. Lastly, please send in your painted models, I have a global Scythes Gallery I like adding everyone’s Scythes too :) Thanks! For the cloaks on my marines I have gone with company colours as to tie in the Aquila colour. It seems to work quite well. OK I will as soon as I get a chance. What color do the Scythes Of The Emperor use for there power cables? Like the ones around there ankles and under some of there triceps. Any suggestions? My go-to is the Ultramarine uniform palette, given their close association (Red, green and occaisionally yellow black striped industrial style). However in effort to maintain creativity, a colour you feel suits and contrasts nicely with Yellow and Black would be good personal choice. We’ve never had much in the way of official uniform details, the most notable it the Aquila chest eagle colouration per Company. I am not sure what color I should use for the aquila on the Space Marine Scouts? 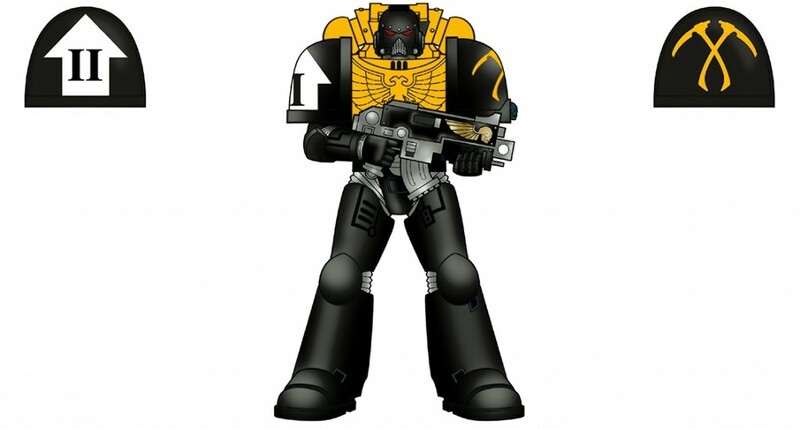 On the http://wh40k.lexicanum.com it says “10th Company: Nominally white, however the company colour is not displayed on their armour, because of their need to blend with their surroundings on reconnaissance missions.” What color do you guys paint the aquila on your Space Marine Scouts? I have tended for classic bone (creating a “White” Aquila) – you could even go all yellow! :) Lexicanum is reasonably true, in that they have no actual “company” except the obvious Tenth (Scouts). Extrapolating from the fiction, it could be seen as a rite of passage for the newly inducted Marine to receive his new armor with Company coloured Aquila, when he graduates from the scouts Company. I am going to be doing some reivers. What do you think would be best suited to them? As they are meant to be stealth/shock troops, would the yellow be used? or would they be full black? what are your thoughts? And as for Company colour, the reivers do not have the chest aquila? would you just default to the knee? When you finish them, give me a shout – be great to add them too the community gallery! I am still working on my Primaris Scythes Of The Emperor army. Also was not sure about the exact sergeants markings besides having the red helmets. I was reading on the Warhammer 40k wiki page on Space Marine sergeants and from what I read it basically said that Space Marine sergeants are usually veterans from the 1st company. So my question to you is would the Primaris sergeants of my 2ed or other company’s have the veteran left knee pad marking or is that marking just reserved for the 1st company? 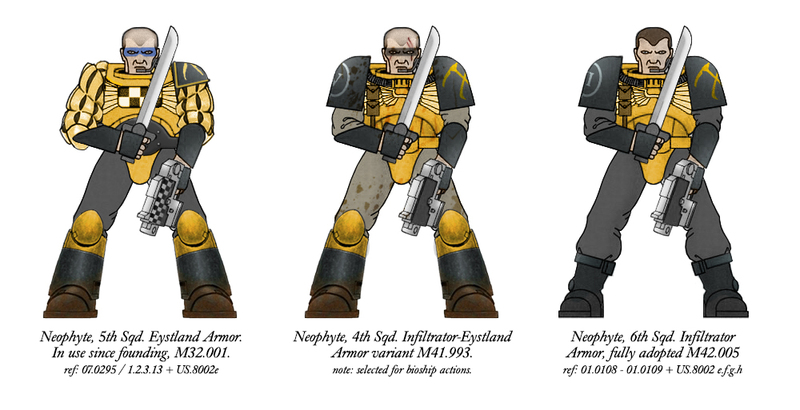 Like the Sternguard Veterans, Terminators, Dreadnoughts or even Command Squads and HQ models? I would like to know what you think about this. I would have sent you some pictures of my squad that I’m working on right know. They are almost finished. I made a custom order of the new style icon transfer sheets that is on the site. From one of the websites you recommended. Also I have emailed the company about why its been taking more than 9 weeks + to make them. He told me that he is really behind schedule. I don’t want to send you pictures of them until they are completely finished. At least one squad/unit at a time. Also with the Veterans Yellow Knee pad and Black Skull. Would they wear a white helmet with the knee pad? Thanks for the information. I did’t mind waiting. I have been busy with Christmas break and New Years also. I have got a question for you about the Veteran knee pad and was wondering what you guys think about it. If a Space Marine Sergeant Veteran with his red helmet white stripe down the top of it would he also wear the Veteran knee pad? 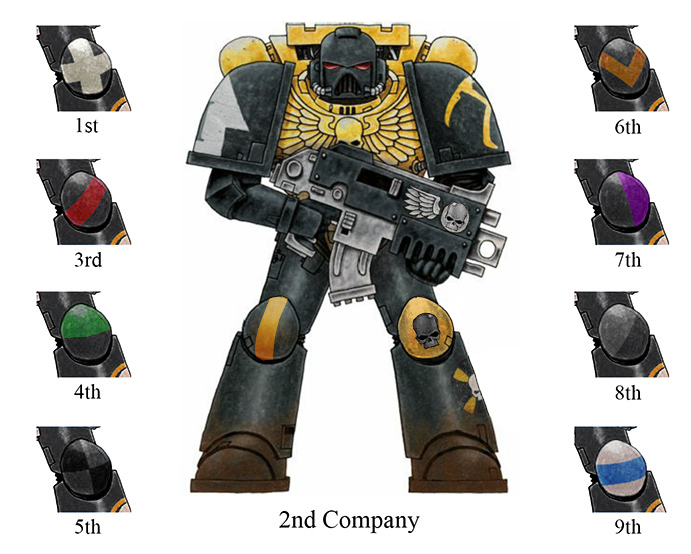 Also all of the First Company would be all Veterans and have the Veteran knee pad would they also wear white helmets like the Ultra Marines First Company Or do they not do the white helmet? Are the white helmets replaced with the Veteran knee pad instead? What do you think about it? By the letter of Ultramarine organisation – I’d say you’re right. However, aesthetically – it could remain black helms and have the kneee pads. Key issue is, the entire First Company is gone, so we have never had any canonical description of what the First look like? If you wanted white helms, you could potentially do a bone white, to be a warmer white against the yellow. A cold white with blue might not work if you use grey in your black, but if you use a blue black? Likely to be more pleasing to the eye. (Colour theory wise). OK thanks for your input. I will be looking forward to see what you find out in a update. If you do one.